47.6 x 27.6 mm. A mythical dragon combined with the grace of the Queen, the 2019 1 oz Silver Australian Dragon Coin Bar is exquisitely detailed and beautiful. The Perth Mint, known for its outstanding purity and craftsmanship in their bullion products, showcases their unique talents in this 99.99% silver bar. In Chinese culture, the dragon is a beloved creature. Many believe it has divine power to bring luck, power and wealth. It rules the ground, sky, and sea with its control of the weather. 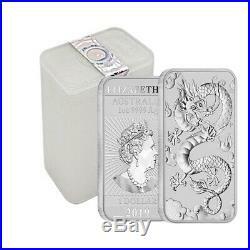 This fierce dragon seems to be flying through the air on this silver bar. Its mouth is wide open and claws are out--hoping to catch a flaming pearl. A'P' mintmark accompanies the exquisite artwork. Investors and numismatics alike will find it a true pleasure to gaze upon this silver bar. Lot of ten pieces, each made from. 9999 fine silver with a weight of 1 troy oz. Individual coins come safely packaged. Lots of 20 come in mint-issued tubes and lots of 200 come in mint-issued monster boxes. Obverse: Jody Clark design of her Majesty Queen Elizabeth II. Rays of sunshine extend outward from her side-profile portrait. 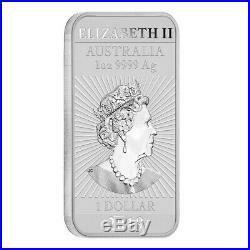 Inscriptions include'ELIZABETH II, " "1 DOLLAR, " "AUSTRALIA, " "1 OZ 9999 Ag, " and "2019. 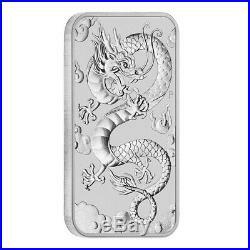 Reverse: A fierce dragon flying through the air on this silver bar. It's mouth wide open and claws out--hoping to catch a flaming pearl. 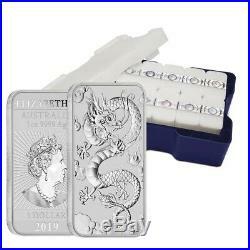 Bullion Exchanges is excited to offer this silver bar along with many other popular products from around the world. Add this beautiful silver piece to your collection today. We will carefully package, wrap, and deliver to your address. Our friendly associates will be happy to assist you. By purchasing from Bullion Exchanges, you are agreeing to all of our Terms and Policies. Bullion Exchanges reserves the right to refuse or cancel any order reviewed by our Compliance Team, which are deemed questionable or have increasing potential risk for being fraudulent. All customers are subject to a review at our own discretion, in which additional information, identification and/or documentation, may be requested. A prompt response would help expedite the fulfillment of your order. Packages are no longer insured if the tracking information shows the package is delivered. We will only be liable to cover packages that are lost in transit or damaged. There are no exceptions to this policy. Once an order is placed, it cannot be modified or cancelled. Using high definition digital video, we record the packing of our products to affirm accuracy. Bullion Exchanges reserves the right to refuse or cancel any order reviewed by our Compliance Team, which are deemed questionable or have potential risk for being fraudulent. Purchasing bullion and/or coins involves price risk, and the purchaser assumes all such risk. We do not offer or make price adjustments based on the market fluctuations of precious metals, or for any other reason. We will never ask the customer to pay more for a product if the price significantly increased, so please refrain from requesting price adjustments after market prices decrease. 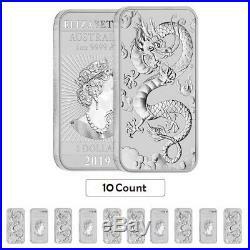 The item "Lot of 10 2019 1 oz Silver Australian Dragon Coin Bar $1 BU" is in sale since Wednesday, February 20, 2019.